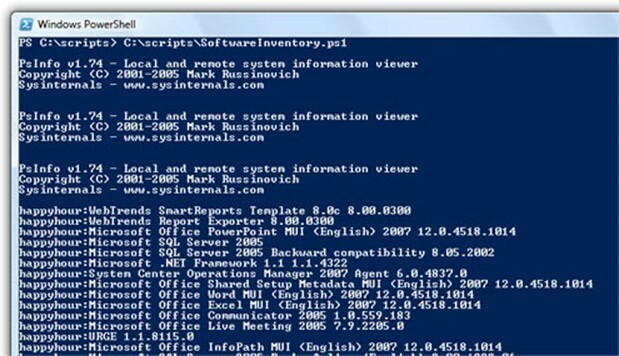 PsInfo is great for gathering asset information from Windows computers, both locally and remotely. PowerShell is great for automation and cleaning up output (among other things) as well as working with database driven data. The following examples show how to gather an itemized list of the installed software on remote machines, process the data, then either display it to the screen or store it in a database. It’s worth noting that PsInfo can also work on multiple remote computers from its native command line, or even read a list of computers from a file (check out the PsInfo site for more info). Since the final example seeks to show PsInfo in a database driven envoriment, PowerShell comes in very handy. Note: In order for this example to work the necessary network connectivity and credentials will need to be in place. The output is merely displayed on the screen. With this method the output can be redirected to a file and imported into an application like Excel for further analysis or record keeping. A database is used to drive the computers polled as well as store the output. The database table is very flat (one table) with 2 fields: ‘Computer’ and ‘Software’. For large amounts of data, this will need to be normalized. 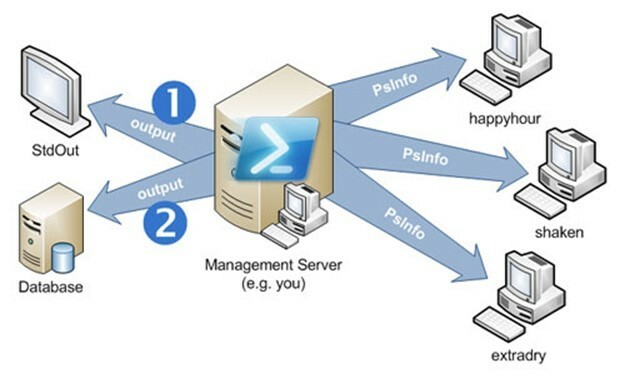 The following PowerShell script gathers a software inventory from 3 remote computers (‘happyhour’, ‘shaken’, and ‘extradry’). Presumably, your computer names will be different. After gathering and parsing the data, it’s then displayed on the screen for all machines successfully queried. $dbConn = new-object System.Data.SqlClient.SqlConnection "server=kcdb;database=Inventory;Integrated Security=sspi"
$sqlQuery.CommandText = "select * from Inventory..Computers"
$sqlQuery.CommandText = "update Inventory..SoftwareInventory set AuditDate = getdate() where Computer = '" + $computer + "' and Software = '" + $softwareItem + "'"
$sqlQuery.CommandText = "insert into Inventory..SoftwareInventory (      Computer,Software,AuditDate) values ('" + $computer + "','" + $softwareItem + "',getdate())"